While Atletico Madrid produced a quality display of football in beating city neighbours Real 4-0 at the weekend and the Africa Cup of Nations provided a dramatic penalty shoot-out victory for the Ivory Coast, the clash between Lyon and Paris Saint-Germain (PSG) was arguably one of the more compelling football matches this weekend. The game finished with a 1-1 scoreline, but the home crowd at Stade de Gerland were enthralled as Lyon maintained their lead at the top of Ligue 1and defied those pundits predicting a comfortable PSG victory. Lyon entered the game without the services of injured striker Alexandre Lacazette who has netted 21 goals in 22 league matches and the absence of the experienced Milan Bisevac in defence was also considered a serious disadvantage for the home team. Many members of the available squad were graduates of the Lyon academy with Christophe Jallet and Yoann Gourcuff providing some guidance on the pitch for the younger players. In contrast, PSG were able to field a team of experienced international players purchased via the backing of Qatar money and they are aiming to claim their third successive French title. A win against Lyon would allow the team to overtake their opponents at the top of the league but a draw would maintain Lyon’s two point lead at the head of affairs. Having won all preceding 10 home games in Ligue 1 and not having conceded a league goal this year, there was some confidence that Lyon could secure a positive result and when they earned a first half lead via a goal scored by 21 year old Clinton N’Jie, the dreams of the home fans appeared set to materialise. During the half-time interval, it had been reported that a member of the Qatar ownership team had visited the away dressing room. Such an act is not considered one of the better options for an owner and the stern face of PSG manager Laurent Blanc as he watched the second half seemed to confirm that story. However, the PSG players appear to respond to whatever was discussed during the break and they were virtually encamped in the Lyon half thereafter. Yet their efforts at scoring an equaliser were repeatedly thwarted by a series of saves from home goalkeeper Anthony Lopes. The award of a dubious penalty for PSG appeared to signal the end of the Lyon resistance, but Lopez saved the conversion attempt by Zlatan Ibrahimovic. As the home fans celebrated, the referee decided that the spot-kick should be retaken for reasons which were unclear and the Swede netted with his second attempt. For a brief period, Lyon threatened to regain the lead but once again they were penned into their own penalty area as PSG sought a winner. 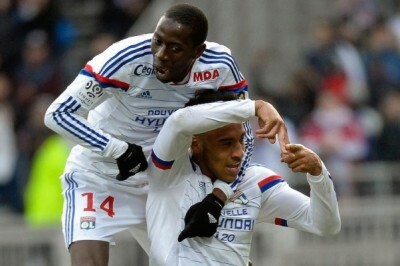 Despite intense pressure from the away team, Lyon survived the onslaught to preserve their lead at the top of Ligue 1. PSG would have led the table by one point had they scored a late goal and it may have been viewed as a turning point of the season. To their credit, the less experienced Lyon players refused to be intimidated by the reputation of the current champions with their fans retaining an unlikely hope that the French title can still be secured.